It is 1967, a young astrophysics student of the University of Cambridge, Jocelyn Bell is working on her final thesis. The research includes a study on scintillation (rapid variation of luminosity) produced by quasars, galactic nuclei distant billions of light years from the Earth. 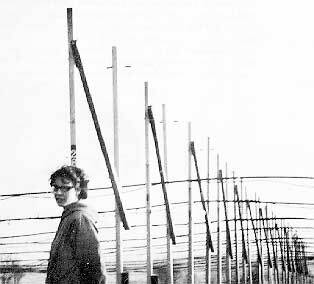 Cambridge 1967, Jocelyn Bell photographed in front of the radiotelescope. As she is analysing the data of the radiotelescope, Bell and the supervisor of her thesis, Hewish, observe a very regular signal: a short radio impulse with 1.337 second intervals. The first recording, on paper, of LGM1, later called PSR B1919+21. In the beginning the two researchers think they have found a signal coming from extra-terrestrials, so they baptize the radio impulse with the name LGM1, where LGM is the acronym for Little Green Man. The hypothesis of a first contact with an alien population is abandoned rapidly, because new signals are recorded in different places in the sky, and with different pulsation periods. Furthermore no orbital movement of the object emitting the signal is observed, which instead would be present in the case of a signal sent from a planet rotating around its own star. It was a pulsar, i.e. a star made of rapidly rotating neutrons, provided with an intense magnetic field and emitting collimated beam radiation (in a tight cone) and it is understood definitively only a year later, thanks to the discovery of the pulsar of the Crab Nebula. 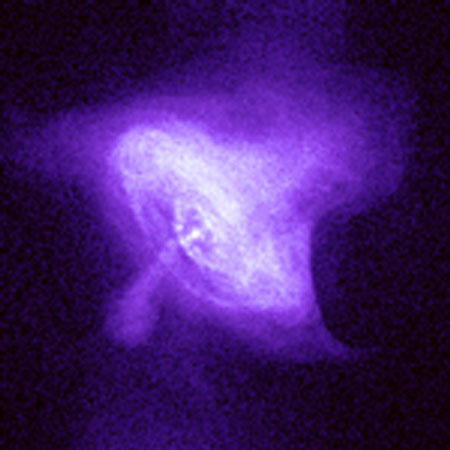 The Crab Nebula seen from the NASA satellite, using Chandra X- rays. The Nobel prize for Physics is awarded for the discovery of the first pulsar. The honour of this discovery only goes to the supervisor Hewish, in fact, Jocelyn Bell is not mentioned in this prize. However the English astrophysicist is always remembered as the first one to really discover the first pulsar. Neutron stars are the final phase of the evolution of stars with a great mass, much greater than the mass of the Sun. Massive stars soon deplete their reserves of fuel, even though in the beginning they have a greater quantity of hydrogen than the small and medium size stars. The Sun and stars with an analogous mass have enough nuclear fuel to shine for 10 billion years, while a massive star, with a mass 20 times that of the Sun, lives only a few million years. The mass of the star also determines the death of the star. When there is a decrease in the supply of nuclear energy that can contrast the gravitational contraction, the central regions tend to compress into an increasingly compact core. In the case of massive stars, the core becomes so dense that it becomes an enormous atomic nucleus with 1057 neutrons, thus evolving into a neutron star. The outermost layers of the star are hurled away in an enormous explosion, known as supernova. One of these events led to the birth of the Crab Nebula and the constellation of Taurus. This explosion was recorded in 1054 by some Chinese astronomers. The neutron star contracts to a diameter of 10 km, reaching an unimaginable density 1014 times greater than the density of lead. Its magnetic fields are extraordinarily intense, and can, as in the case of dynamos, generate powerful electric currents and accelerate the electrons. Neutron stars have an intense magnetic field. More specifically, the Earth has a magnetic field that ranges from 0.3 to a few Gauss (Gauss are the units to measure magnetic flux density), while a neutron star can reach up to even 1011 Gauss. And it is due to the extreme magnetic field, the radiation that is produced (these are electromagnetic waves in the radio wave band) is not emitted in all directions, but forced to travel only in two very tight cones, that are aligned with the axis of star’s magnetic field . The star’s rotation axis and the axis of its magnetic field, however, do not coincide. As a consequence, while the star rotates, the magnetic poles rotate and are shown to the observer alternately. When a radiation cone is in the direction of the Earth the radio impulse reaches us. Exactly as in the case of a beacon, we see the light only when it is in our line of sight. 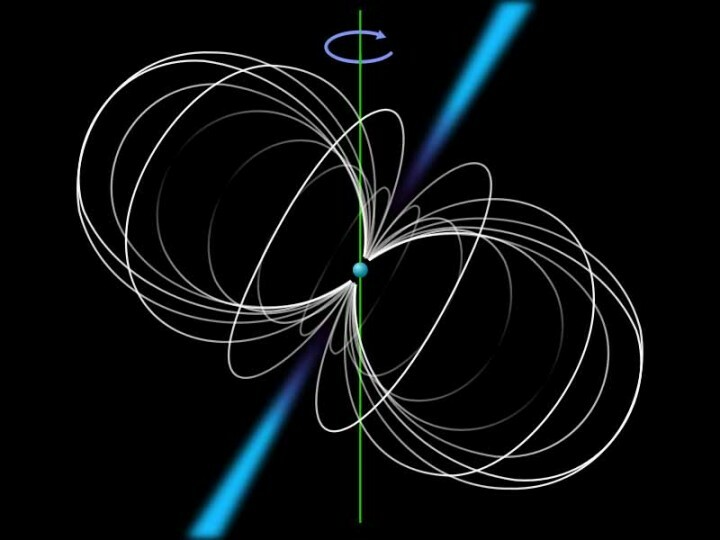 Schematic view of a pulsar, the white lines are the lines of the magnetic field. The radiation (coloured blue) is emitted in tight cones along a direction that is not aligned with the axis on which the neutron star rotates (green). If you watch an ice skating competition or a diving competition from the diving boards, you will certainly be fascinated by the speed with which the athletes are able to spin, and how lightly and naturally they are able to slow down or accelerate by simply bringing their arms and legs closer to or further from their body. Underlying this mechanism is a law of physics called the law of conservation of angular momentum. Angular momentum is a measure in physics that depends on the speed of rotation and the distance of the mass from the axis of rotation. In the case of the ice-skater, when the athlete brings his/her arms and legs nearer to the axis of rotation, the distance decreases and consequently, in order to maintain the angular momentum, the angular speed of the skater will increase. The same phenomenon gives rise to the extremely rapid rotation of compact stars like neutron stars that form from the very large stars. When the star contracts, forming the compact nucleus, its speed increases enormously. Neutron stars in fact rotate at very high speeds even 100 times per second. Forty years after the discovery of the first pulsar, in 2003 it was again a woman to give a fundamental contribution to the development of knowledge about these celestial bodies. It was a young Italian astrophysicist, who at the time was a Ph.D. student, Marta Burgay. “In 2003, I was working at my Ph.D. thesis”, the astrophysicist tells us, “I was in Australia with other colleagues to carry out observations. I had to observe and analyse the data of a part of the sky, in search of periodic signals coming from pulsars. I was working with radio telescopes that can detect radio waves, and to complicate our work there were also terrestrial interferences, like those of a blender turned on. Some time later, however, analysing the collected data, I noticed a very particular periodic signal. It was the signal of a “millisecond pulsar ” a celestial object rotating very rapidly”. “ The exceptionality”, the researcher pointed out, “was because of the fact that the pulsar that we discovered was rotating around another pulsar. 1700 pulsars have been discovered till date in our galaxy, out of these about ten rotates around another neutron star, but only in this case the star around which the pulsar was rotating was also a pulsar which emitted a beam of radio waves”. Binary pulsars are important for many reasons, because it is possible to measure their masses directly only in configurations of this type, and also because they open the way to new verifications of the theory of relativity, as for example an indirect proof of the emission of gravitational waves. The observations that are being carried out will be a test for Einstein’s theories: in fact reference is made to relativistic astronomy.